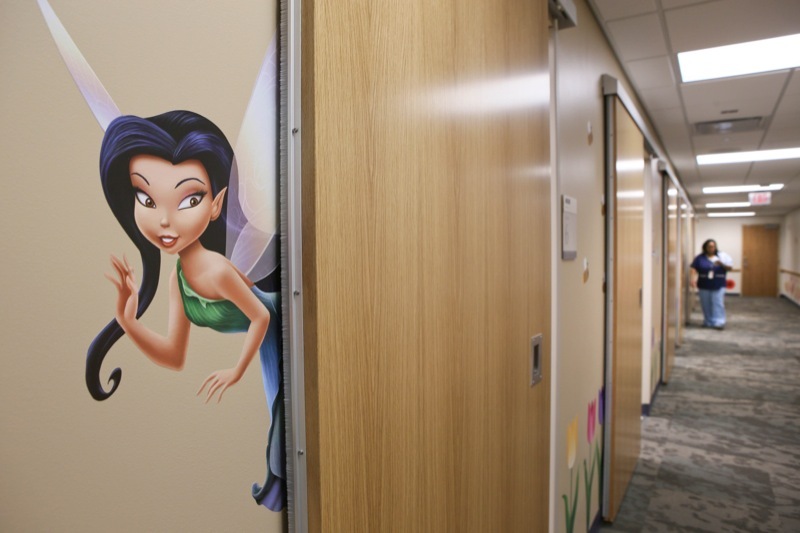 Young patients will be charmed by the fun wall art. 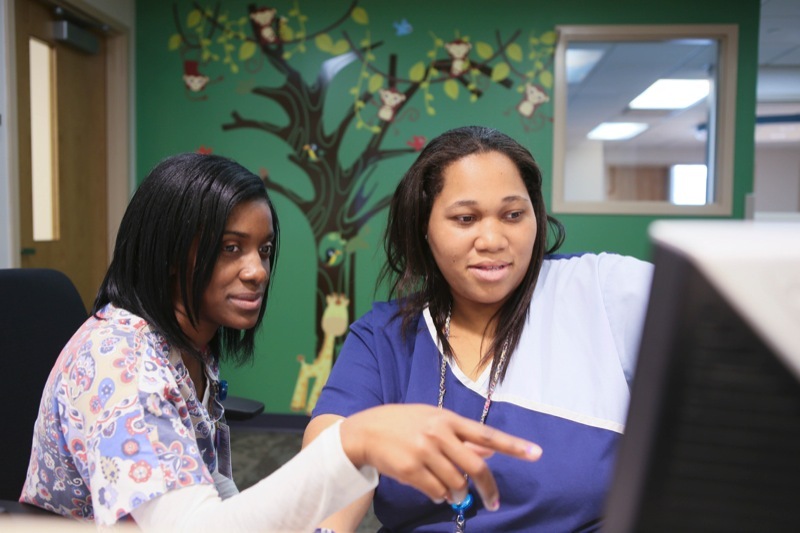 Akron Children’s neurology patients will notice a brighter “neighborhood” feel on their next visit with colorful tulips, trees and birds on the walls and, more importantly, a more efficient, streamlined flow for getting in and out of appointments. The redesign of the neurology department is just the start of massive remodeling of the hospital’s neurodevelopmental science center, which occupies the 4th floor of the Considine Professional Building. Brainstorming began 2 years ago and involved all levels of providers and staff, as well as patient families. A kaizen, which focuses on continuous improvement, was held in a local warehouse with the true-to-size proposed floor plan mapped out with cardboard walls and tested by the center’s staff and parents pushing strollers. Shannon Jackson and Darcel Alexander greet patients at check in. 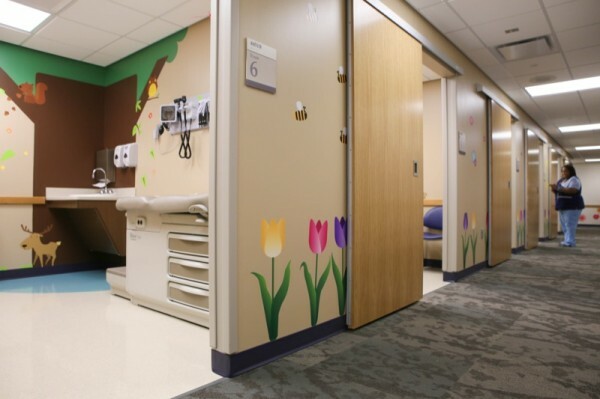 “We knew there were inefficiencies in the floor’s original design and this could, in part, be contributing to delays in getting new patients scheduled,” said Sherry Valentine, a Lean Six Sigma deployment leader at Akron Children’s Hospital who led the remodel as her graduate school capstone project at Ohio State University. While everyone would love to have a spacious office, the team concluded that making physician offices smaller could make way for additional patient rooms. Some doctors even remarked that less office space was needed in the era of modern medicine, where patient records are online and bulky medical books are also largely obsolete. By reducing the size of offices, the department was able to gain 7 additional exam rooms. These rooms feature 2 doors. Patients come in the “front” door and providers come in the “back” door, which is near their offices and workspaces. Sliding doors take up less space than traditional swing doors on exam rooms. Over the course of a day, this means a lot less wasted time walking down long hallways. Eventually the floor will have redesigned neighborhoods (also called pods) for the center’s disciplines of developmental-behavioral pediatrics, physiatry, neurosurgery, neurology-epilepsy, and neurobehavioral health. “We are learning from this first neighborhood and may tweak things as we move forward,” said Carrie Gavriloff, administrative director for the neurodevelopmental science center. Using glass walls in offices. This allows sunlight to be shared with clinicians who work at interior cubicles and also allows colleagues to immediately see if providers are in their offices for more efficient collaboration. Wall tables in exams room. These semi-circular tables allow providers to face patients as they read and update medical history rather than having their back to them. The monitor is on a swing and can be turned to show parents an image. Shared spaces. The center has several multi-disciplinary clinics. A large table allows teams members to gather together to discuss cases and they can review video of patients or imaging studies on a large screen. 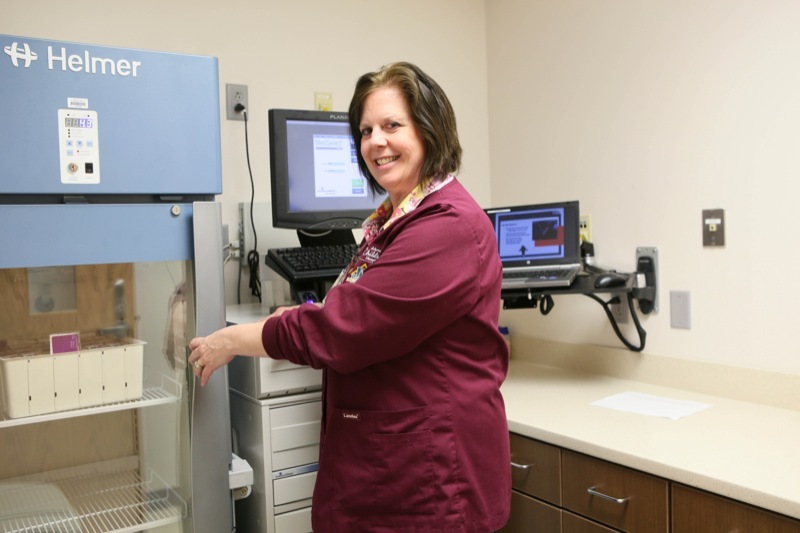 Kim Oldfield, RN, shows off a new addition to the neurology department, a MedSelect cupboard that secures and automatically dispenses medicines. The physical space is only part of the solution to improving efficiency. Valentine and her Lean Six Sigma team have helped the center adopt standardized work instructions and cross train some positions, such as medical assistants and patient service representatives. After revamping the center’s scheduling process, the team has already improved access. The goal was to improve efficiencies so providers could handle 2,000 more patient visits per year.